Win an Oxylent Prize Pack! Starting fresh this fall with new health habits? An Oxylent prize pack could be just what you need. Win an Oxylent prize pack (a $40 value)! A new season can call for an improved self, perhaps a new supplement is for you! For some of us the thought of swallowing a pill is simply an unappreciated challenge. I remember my mom trying every trick in the book to get me to swallow a morning vitamin, from hiding the pill in peanut butter to mixing it with applesauce–she even purchased a pill crusher in order to guarantee I got my daily dose of vitamins. I know she would have appreciated the ease of using children’s Oxylent and sending me out the door with minimal tantrums. This effervescent beverage is filled with electrolytes, enzymes, amino acids, antioxidants, vitamins and minerals, without any high fructose corn syrup, artificial additives, preservatives, fillers or dyes. Oxylent comes in convenient pouches making it a nice fit for your “on the go” lifestyle”. Oxylent simplifies my day, and really classes up a glass of water. With a variety of sparkling flavors – pomegranate, mandarin and berries – you may find that Oxylent supplements become more of a treat than an added chore. Buy online through the Oxylent website! Or find a store near you! 2. 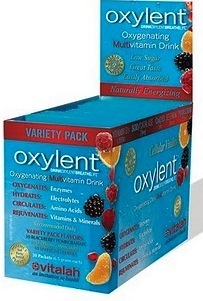 “Like” Appetite for Health on Facebook, and please “Like” Oxylent on Facebook, too. 3. Leave us a comment below (not on Facebook please) telling us why you’d love to win Oxylent. Remember, extra credit is given to those who share AFH nutrition or fitness articles on social media–tell us where you shared (a link is handy)! Open to US residents. Entries will be accepted until midnight EST on Tuesday, October 1st. All AFH Terms and Conditions Apply. I am signed up for free e newsletter, Like AFH and Like Choffy on FB. I am so eager for a coffee substitute that is a healthy alternative to drinking coffeee all the time and need a healthy change. I never tried it and I know AFH only advertizes the best products on the market. I trust AFH and who they sponsor and love and still purchase the produxts I was introduced to in the past. Thank you AFH and Choffy for introducing great stuff and for us to give it a try to become long term happy customers. I subscribe to the e-newsletter, Like Appetite for Health and Drink Oxylent. Breathe Life. on Facebook. I’d love to win Oxylent because I need to boost my immune system. Aside from the obvious getting vitamins, minerals, etc. into our diet, this may be a great way to get my daughter to drink more water. Want this …..trying to get healthy!!!!! and influence my grandchild! We could really use this. With our daughter we are ALWAYS on the go and could use the pick me up! I love pomegranate and could always use vitamins! I would love the chance to win this to try it. Thank you so much for the chance to win oit! I would love to try the pomegranate! I am such a baby when it comes to swallowing pills. I usually buy chewable vitamins. I get the newsletter and follow on Facebook. I would like to try this because I do not like vitamin pills. pomegranate and could always use vitamins! I subscribe to the newsletter. I follow on facebook. I would like the vitamins and the health benefits. I’ve been googling the best vitamin supplements and this brand kept coming up. Would love to try it! I like that it’s not a pill. Would love to try it! Something new like to try it. I am not a fan of the huge massive horse prenatal pills, they make me gag and I cant take them. Anything liquid I can take very easy. My husband and I are currently actively trying for a baby & this would be very helpful. I got a sample of it in the mail today and would really love to have some more. I have one ovary so this experience of us trying to have a baby has been rough. I’d love to try this! I get tired of regular water and I’m looking for something that doesn’t have all of the unhealthy fillers in it. I have two very active teens and I do crossfit so anything that would help replace nutrients would be awesome to try! I would LOVE to try these. I have a hard time getting one of my daughters to take supplements and this looks like the perfect thing for her! And they have much better ingredients than most other children’s vitamins. I have a hard time taking a ton of pills to get the vitamins and nutrients I need so I tend to forget/avoid taking them. This would be a great change but allow me to get everything I need to be healthy! Anything that will promote my health, and is convienient, would be a great addition to anyone’s health regimen! This would be awesome to win as to stay healthy through the winter by giving the immune system a welcome boost! really becoming aware at my age of doing everything possible to stay healthy! I also work hard to find the right kind of vitamins for my child that are not candy looking and are of good quality! Thank you for your recommendation and giveaway. I would love to find a healthy vitamin product for my 9 year old daughter, all the popular vitamins are just bad for you. It would be nice if we could start our day together taking the vitamins. I’ve been drinking more water, with liquid flavoring added, but they don’t have any added vitamins and all like this. Sounds easy to do..what could be easier? I use most of these ingredients in pill form. This would be so great. Tastier and money saving! Excited to try this! Can’t wait to try this! Need to make water more enjoyable. I need more vitamins in my diet. With our daughter we are ALWAYS on the go and could use the pick me up! I would love to try Oxylent~ I am not a pill person but gotta get vitamins and antioxidents some way! I use Emergenc alot but this has so much more! I like them on FB. Thanks for the giveaway! good way to get in the vitamins!! I’ve decided to make a change in my nutrition habits – namely, start taking vitamins. This would make it so much more palatable. I’d love to try these to help with my health and nutrient intake. I receive your newsletter and like you both on Facebook. I would love to win this because I get dehydrated easy and water is not my drink of choice! I would have loved to win this but it seems I found it a bit to late. Hollye B., Jennifer H., John, Angela W., Lori, Amanda H., Jessica, Jene, Bernice and Robert S.